I moved to Sutherland, Nebraska in June 1979. My wife, Marie, followed me in August of 1979 after completing her contract with Western Nebraska Technical College. I had previously been practicing Medicine in Bridgeport, Nebraska, and Marie was the Director of the Cosmetology Program. Our first contact prior to the move was the current president of the Hospital Board, Ken Beatty. We had already visited with the current Physicians, Drs. Tran and Pham about the practice and it seemed like a good opportunity for us and it would move us closer to my wife’s family in Grand Island. The Power Plant was still being built and it was difficult finding a place to live. We made arrangements for a small house and when we arrived, much to our surprise, the tenants decided to stay and the landlady told us we would have to make other arrangements. Pat Thomas quickly found us a place to live in his mother’s mobile home next to Charlie and Alice Fleecs’ house. We were very lucky to even find this. On September 25, 1979, Dan’s brother came to visit for the first time and ironically that was the same day we discovered we would be expecting our first child. Marie joined the Mrs. J.C.’s and Dan had time to develop the practice. I remember the winter being particularly cold and icy. Marie drove to North Platte every day to work as an instructor at the North Platte Beauty School. In 1980, our first child was born, a baby girl, Kaili Marie Nguyen. This was the first of Dan’s family to be born on American soil. One month later we bought our first home and moved in July 1, 1980. It was located at 411 Elm. We remodeled it extensively and lived at that home nearly three years. Elmer and Bonnie Nelson were our neighbors to the south and they were just like our surrogate parents. 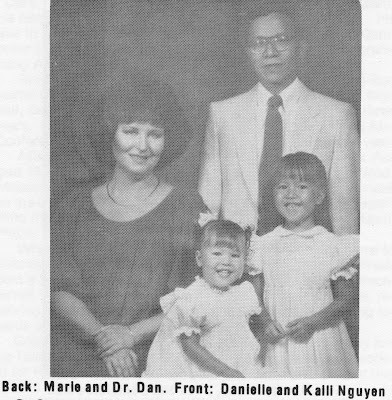 In October of 1982 we discovered that a second addition to the Nguyen family could be expected in June of 1983. We decided to put the home up for sale and look for a bigger home. In the meantime our daughter, Kaili attended Grandma Ruby’s Busy Bees Pre-School at age 3. Finally our home sold in April of 1983,and we bought a home down the street at 211 Elm. We moved in April 16, 1983, and our second daughter was born one month later. We named her Danielle after her father, and she too was a beautiful baby girl. We lived and worked in Sutherland for five years and planned to live there and raise our family, when suddenly an opportunity to buy another practice in North Platte came to our attention. This meant a move closer to the hospital. It was pretty clear after faithfully serving the Sutherland community for five years that this was not realistic on a full time basis. Dr. Dan decided it would be better to practice in Sutherland part time and in North Platte part time. On September 3, 1984, we moved to North Platte, and both Dr. Dan and Marie continued to drive to Sutherland to continue working there. Marie has since retired from hair dressing and is working in North Platte, while Dr. Dan continues to serve the people in Sutherland at the clinic. 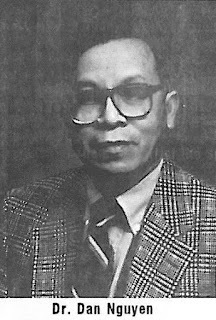 While living in Sutherland, the Nguyen family were members of Sacred Heart Catholic Church, the Mrs. J.C.s, the Lions Club, the Optimist Club and an extension Club. We have fond memories of living in Sutherland and still keep in contact with many of our friends there. Great post!I am actually getting ready to across this information,i am very happy to this commands.